Gerald McDowell, originally from Hope Mills, N.C., graduated from DeVry University in Atlanta in 1987 with a B.S. in Computer Information Systems. He spent more than 18 years in the IT industry, managing projects in more than 40 states and 12 countries, and he was also a small business owner for nearly five years. Additionally, Gerald served as a teacher for two years as an evening Instructor at DeKalb Tech. In his previous tenure as President and CEO of The JILAS Company, Gerald leveraged his entrepreneurial skills to find a software company to provide software solutions and services to church groups. He raised $600,000 in investment capital to support the establishment of the company and completed projects in Haiti, Argentina, Panama, the Dominican Republic, Brazil and Ecuador. Gerald was on staff with the Gwinnett Village CID (now Gateway 85 CID) and Gwinnett Village Community Alliance for four years. His efforts resulted in more than 250 commercial property owners joining the CID, which accounted for $700 million in property value. He also assisted in creating the Gwinnett Village Merchant’s Association. Gerald’s successes with the Gwinnett Village provided the experience he would draw from as the first Executive Director of the Lilburn CID – a position he occupied for five years. Even though this CID was formed during a time of national economic recession, Gerald was instrumental in securing $2 million in grant funding. 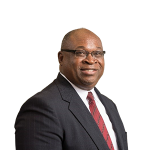 In 2015, Gerald started as the Executive Director of the Airport West CID, which joined the Airport South CID in January 2016 to become the Aerotropolis Atlanta CIDs. Under Gerald’s leadership, the Aerotropolis CIDs have received more than $50 million in grants and project funding. Gerald manages the operations and development of both Airport West and Airport South CIDs, and he is responsible for an operational budget of $2.5 million. Gerald was a member of the inaugural USDOT Leadership Academy conducted by U.S. Transportation Secretary Anthony Foxx. Additionally, Gerald was a key event speaker during the 2016 Sustainable Airport Area Seminar, focusing on issues related to workforce development, transportation and urban design. Gerald was a featured speaker at the 2017 Aerotropolis Asia Conference in Singapore and a panelist for the 2017 Metro Atlanta Redevelopment Summit. He was also named a 2018 Notable Georgian in the January 2018 issue of Georgia Trend. He currently serves on the boards for the Aerotropolis Atlanta Alliance, Council for Quality Growth, Georgia Chamber of Commerce, Georgia Foreign Trade Zone, New Life Community Center and Global Center for Teaching, Learning and Development. He is a 2008 graduate of the Georgia Academy for Economic Development and a 2009 graduate of the Gwinnett Neighborhood Leadership Institute. Gerald and his wife, Toni, have been married for 28 years. They have two children: a daughter, Taylor, 24; and a son, Wesley, 21.